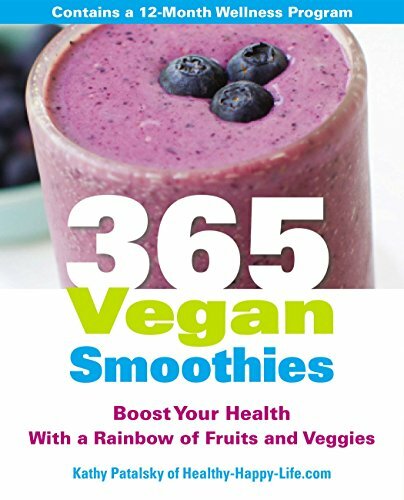 [PDF] 365 Vegan Smoothies: Boost Your Health With a Rainbow of Fruits and Veggies | Free eBooks Download - EBOOKEE! Description: From one of Americas most vocal health-food advocates: a bounty of delicious, healthy vegan smoothies that deliver fun, flavorful wellness every day of the year With 100,000 Twitter followers and a blog that receives half a million unique visitors a month, food writer Kathy Patalsky loves sharing her passion for healthy, vegan cuisine. With 365 Vegan Smoothies, she makes it possible for everyone to enjoy this daily diet enhancement that is free of animal products (even honey) and the saturated fats, chemicals, and hormones that often accompany them. From her frosty sweet Peach Pick-Me-Up to green smoothies such as her revitalizing Green with Energy, Patalskys innovative smoothie recipes are built around themes such as brain boosters, weight loss, healthy digestion, and detoxification. She also includes mood tamers, such as the Cheerful Chocolate Chia, with B-complex vitamins and omega fatty acids to boost serotonin levels. Featuring vibrant color photographs and simple steps to stock a healthier pantry, 365 Vegan Smoothies serves up the perfect blend for everyone. 2017-11-03[PDF] Linkedin Success System: Boost Your Career With Linkedin! 2017-12-09[PDF] Supercharge with Superfoods: 365 Ways to Maximize Your Health! No comments for "[PDF] 365 Vegan Smoothies: Boost Your Health With a Rainbow of Fruits and Veggies".